Spotlight on: Miche Luxe prima shell Quincy! Can a girl ever be too rich? We don’t think so—and sometimes richness is what we crave in a handbag too! The Quincy for Prima Bags features faux leather in deepest dark chocolate. An overall crocodile pattern and sophisticated criss-cross buckled strap details with rich antique brass hardware will make you feel and look like a million dollars every time you wear her. Side pockets. As part of our Luxe line, Quincy comes with matching stylish twisted handles, key fob and a dust cover for easy storage. Can’t visit Paris this season, but want runway fashion? 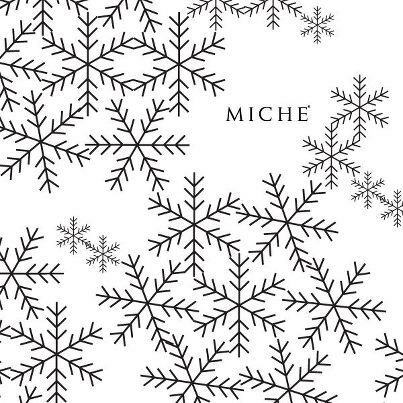 Miche Luxe Lucerne shell will deliver! Rich metallic stud detailing partners with a cool grey ~ Just add classic pearls to your outfit and you’re ready for a special occasion dinner! The Lucerne Shell for Classic Bags features a cool shade of chromium grey soft faux leather accented by oversized stud and grommet detailing in various metallic colors. End-pocket storage is the ideal finishing touch. Lucerne is playful and flirtatious and is as at home at a bistro lunch in Paris as she is on a stroll down the sultry streets of New Orleans at midnight. Where will you let this stylish mademoiselle take you? As part of our Luxe line, Lucerne comes with matching handles, key fob and a dust cover for easy storage. Spotlight on Miche Luxe shell Lincoln! Do you have an important evening planned that you’ve been waiting weeks to enjoy? You have the perfect outfit. The perfect hair style. The perfect make-up. The perfect shoes. Now you just need the perfect finishing touch—the right Miche. The Lincoln for Demi Bags is your go-to choice for any special occasion. Ultra-rich deep maroon faux leather in a diamond pattern is offset by the delicate shine of a myriad antique brass rivet accents. Side pockets. As part of our Luxe line, Lincoln comes with matching handles, key fob and a dust cover for easy storage. Miche opportunity meeting Sept 15th – Milwaukee Wisconsin! way to make extra cash! Attend a “Discover the Possibilities” event near you this fall: It’s FREE! Our next event is being held in Milwaukee Wisconsin on September 15 BE my guest-if you sign up to become a Miche representative during this event, you get FREE TRAINING on this date with the ‘PARTY WITH A PURPOSE TOUR’–that immediately follows!! Contact me at sdhmhandbags@aol.com to find out more about registering for this event, or call me at 815-721-5549! Out of stock alert for the Miche textured black wallet~ projected re-stock date Mid September. Miche SALE on classic bases !! 30% off ~ starts TODAY!! You will find when you click on the link that your order is already attached to a party!! This party is special—every order enters for a chance to win a free gift, so please consider leaving your order attached to the party!